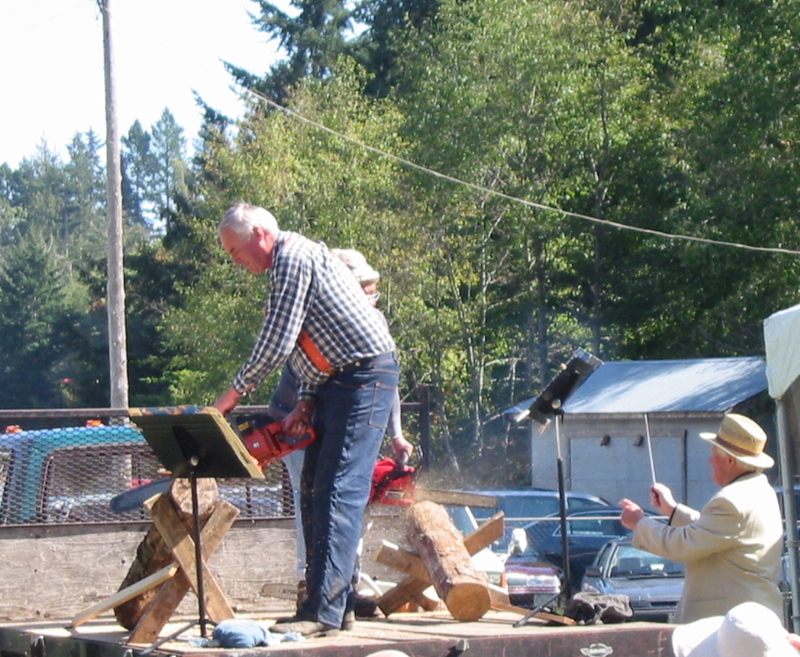 Norman conducts the chainsaws at an early Fling. I can recall a few funny moments with SPO. Norman in his infinite wisdom decided the SPO would accompany the Sooke theater group for some musical productions. The theater group was on stage and we were on the floor in front of the stage. During the performance the actors would get quite warm on stage and so they would open the rear doors. We, the musicians would freeze in the pit. I was able to get some warmth by bringing a small portable space heater, about 6″ x 8″, and ran an extension cord to an outlet outside the theater. Austin Scott, flute, noticed this and the next night he brought a space heater the size of a accordion case and plugged it into the power receptacle along with his stand light. A warm red glow flooded the pit and a few minutes later, while we were all playing, all the stand lights when out and the pit orchestra ground to a halt, until the circuit breaker was found several minutes later. During a performance of the ‘Sound of Music’, there was a scene where the family was in the graveyard hiding from the Nazi storm troopers. During this time the English Horn (played by Jim Warner) held a note for many bars while the rest of the orchestra remained silent. In one of the later performances the musician sitting next to Jim began caressing the inside on Jim’s thigh while Jim played the note. Although his vibrato quickened, Jim, like the trooper he was, held the note until the bitter end. Then without taking his eyes off the music, he whispered, “you son of a *****” and began playing again. During the same scene and on the last performance of the ‘Sound of Music”, our brass section decided to ad lib. As the family was hiding, one of the family members says “shhh, troopers” and points to the Nazi troopers walking onto the stage. At this point, the brass section played the “storm troopers” theme from Star Wars. The expression on Norman’s face was priceless. With that, SPO came into being! Norman’s great patience with us. coming from our instruments, was priceless! In the fall of 1997, we got a call from Kathy Kirk, who told us to go to St. Rose of Lima, on Saturday afternoon; Norman Nelson was setting up an orchestra. Kealan, my thirteen year-old son, and I knew Norman from the Purcell summer music school in Victoria. The rehearsal was in the rather dark church basement. There were a lot of large, round white tables that had to be cleared away and put back at every rehearsal. Also, it was cold. As I remember it, we rehearsed most of the winter. The cello section at the June concert consisted of Janette, Marsh Yawney, and Kealan and Sonja. Marsh was a last-minute addition to bolster the ranks, and of course Janette was in Texas (or somewhere) for most of the winter, so the cello section at many rehearsals was Kealan and Sonja, both of us beginners. We had started on the cello within a year or so of each other, Kealan first. Our only orchestra playing experience was the Victoria Conservatory Junior Orchestra, conducted by Trudi Conrad, who showed us how conductors beat 1-2-3 and 1-2-3-4, and provided us with the advice of a seasoned orchestra player, such as: Always be nice to your stand partner. Bring him or her small presents, such as a pencil decorated with musical notes. Not advice we ever got from Norman. Incidentally, the VCM Junior Orchestra that year had a considerable number of what were to be illustrious players: the Chooi brothers, Sam Seong, Hollis and Laine Longton, Adrian Dolan. Sonja was the only grown-up. Laine was my stand partner and she was so tiny she brought her own little chair. In the newly-hatched SPO, Kealan was my stand partner. Norman was very patient with us and would sing us our parts when there was complete silence, or worse, in the cello section. Norman is a terrific, fun, and above all, musically fascinating conductor. Until I started playing in another orchestra a few years later I assumed that’s what all conductors are like. The cello section stayed thin for a few years but Norman must have been sacrificing to the right gods, because our ranks filled out with some excellent players. There are no silences or even many odd sounds in the section these days. Fifteen Years with the Sooke Philharmonic Orchestra! I am extremely privileged and lucky to be a founding member of the Sooke Phil. Founding member and oboist Jim Warner, who sadly passed away last year, called and invited me to play with a new orchestra that was being formed in Sooke. Always happy to play music with friends, I accepted the invitation and drove out to the St. Rose of Lima Church in Sooke for the very first rehearsal! Our conductor was, of course, Norman and when I found out who he was I almost fell out of my chair!! We had a small but determined group of people in the first rehearsal as we embarked on Beethoven’s First Symphony. It is safe to say that each and every piece of repertoire that we have undertaken over these 15 years has been challenging from beginning to end. Just when I think I’m catching (on after long bouts of practice) Norman leads us around another corner to strive with more challenges. Norman’s determination to play beautiful music with us never wavers even though I know his patience has been sorely tried many times! I offer my thanks to Norman and Jenny for their hard work and my thanks to my fellow musicians, Board of Directors and many, many volunteers! We are a lucky bunch! 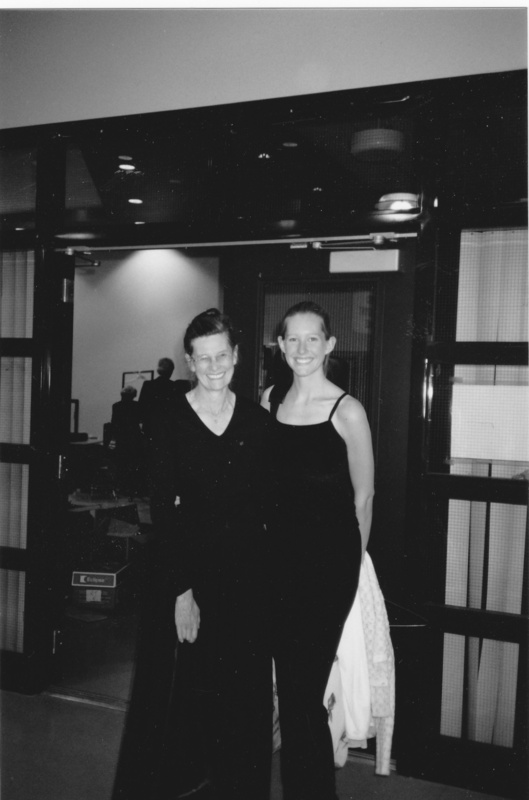 Ros and Louise Alexander. June 1999. 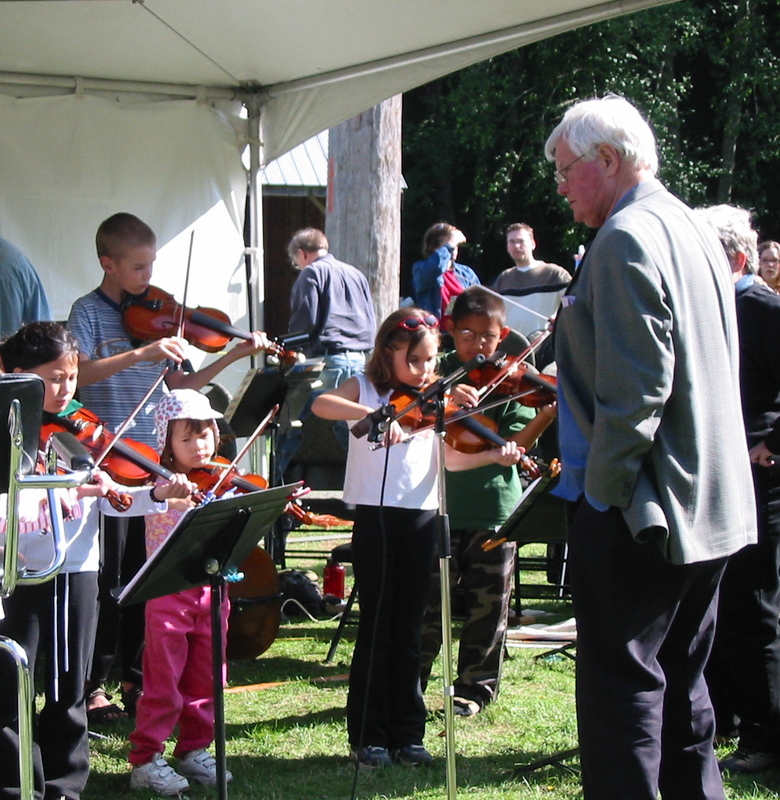 Hard as it is to believe that 15 years have gone by since the founding of the Sooke Philharmonic in 1997, it is even harder for me to remember those early days very clearly. I do remember a musical dinner party at the home of a Sooke friend from the Hampton Orchestra where I first met Sue Innes, and learned of Norman Nelson’s retirement to Sooke and his plans to found an orchestra in his new home. At that point I hadn’t met Norman and Jenny, but was soon to have that pleasure. Even at that first meeting with Sue, never one to let what appeared to be an opportunity pass, she felt me out about driving out to Sooke weekly from Victoria, and urged me to sign up. The weekly Saturday afternoons in the basement of the original St. Rose of Lima Catholic church, just off the highway, were always interesting and inspiring, though often challenging. The lighting was dim to say the least, and while Norman’s enthusiasm figuratively lit up the space, he quickly ensured that better lighting was secured. I also remember being cold much of the time, but then it was a basement, and the amenities we are now used to in Janette Chrysler’s beautiful rehearsal hall was not then available to us. However, physical surroundings aside, we all, small band that we were, realized what a privilege it was to work with Norman, and word spread fast. While I was floundering my way around and through the great classical literature that Norman chose for us, my daughter Louise was finishing her music degree in violin performance at McGill. Norman, with his abiding interest in the young, and their education, knew this, and suggested that she perform a Mozart Concerto with the orchestra in June of 1999. I opted out of the orchestra for that piece, as I didn’t feel that I could adequately concentrate on accompanying while listening. Instead I chose to be an audience member, crying my eyes out in the back of the hall. It was one of my proudest moments, and I will be forever grateful to Norman and the Sooke Philharmonic for giving Louise the opportunity for her first solo performance with an orchestra. I remember that dark church basement where we plodded through Beethoven’s First for a whole year. It could be tricky to find a place to sit where one could actually see Norman conducting. I remember a mother-son cello team, with Kealan still wearing his uniform from the soccer game he had just played. His mother is still playing with us. Yay! Who could forget all the times that Norman managed to throw away his baton during a concert, usually into the orchestra. And now Sooke Philharmonic Chorus conductor, Wade Nobel, seems to be following in Norman’s noble footsteps. With the encouragement of my supportive father, upon graduation from high school at age 16 I wrote the famous Mr. Norman Nelson and inquired as to getting a job in the Vancouver Baroque Orchestra. Instead, as you may not know, I attended the sweet, small Mount Allison University for my Music Ed Degree, where we concentrated on all the Baroque composers – Monteverdi, Allegri, Corelli, Scarlatti, Albinoni, Sordini – well maybe not Sordini but you get the picture. I was in tune with it all, and led the orchestra with developing confidence under the baton of Malcolm Macleod – he was a viola player (need I say more?). Grad (I am not saying which one), and after a summer of NYO fun, I listed my residence as Vancouver where they flew me, and I began studying there when the Purcell String Quartet was in residence at SFU. Coincidentally, my brother was #2 in command in the SFU computer department, and it was natural for me to go every week to benefit from the chamber music guidance offered by the quartet. Thinking back, I got lifts to rehearsals from well-wishing people every week – and it is really something to think of the positive influence this generosity offered to my musical development. Having moved to Vancouver Island and become involved with that musical community I was aware for some time of the whisperings of an orchestra forming in Sooke – as Norman had chosen to retire there – and when the word came out of it actually starting, well, nothing could hold me back! I recall the first rehearsal, when he said “Violin eh? Where do you play now?” My response involved a statement ending with “But I play second” to which he asked, “Do you want to play first?” When I answered “Yes” he emphatically echoed “Yes” and with his gesture and “Sit here then”, I was instantly first violin. Yipee! We played Beethoven’s 1st and that first rehearsal was FUN, challenging – we took it “up to speed” and my fingers worked – and it happened! Imagine playing Beethoven after all that Baroque – it is like moving from Kraft Dinner to gourmet omelettes made with FRESH EGGS! When we had our 10th year anniversary I was there along with a handful of founding members of the orchestra – but my mind boggling lesson was that we were a blimp on the scene compared with the other many present who were organizers, contributors, volunteers, board members past and present, and from all over the continent and world. I discovered that Norman is a genius in many ways – often unseen and perhaps inadvertently unappreciated, so “Thanks Norman”. I must admit that when I was invited to my first Sooke Philharmonic Orchestra rehearsal, I thought the name was a little grand for such a small assortment of musicians gathered in a tiny church, but the tremendous enthusiasm and camaraderie of the players and conductor were there from the start. Those early rehearsals, struggling away (I think occasionally I was the only first violin) with Norman’s emphatic exhortations to “play the music, not the notes” were exhilarating and really improved my playing and confidence. It’s no surprise that, with Norman’s inspiring leadership, the orchestra grew rapidly and soon lived up to its name. The Sooke Philharmonic has provided many musical highlights for my kids too, from coming to an October concert in their Halloween costumes to joining in the Radetzky March at the Fling. My older daughter has enjoyed playing with the orchestra for a couple of years. I can’t think of a better place to first experience the thrill of being in the middle of a great symphony! My younger one is working hard on this year’s Fling music. We’re very grateful to Norman and Jenny, the Sooke Philharmonic Society, orchestra members and the community of Sooke for fifteen years of wonderful music and memories.